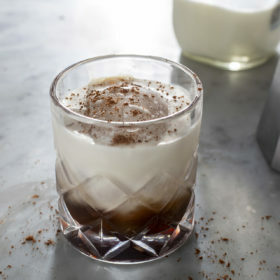 Necessity is the mother of invention, as proven by this cocktail, created in a pinch when a bartender ran out of cream while asked to make a White Russian. This serene island, the largest in the Cayman Islands chain, is home to the boozy milkshake known as the Mudslide. The drink was created at the Rum Point Club’s Wreck Bar sometime during the 1970s, all because the bartender didn’t have fresh cream on hand. Guests came to the bar and asked the bartender for a White Russian made with vodka, Kahlua and cream, says Carol Boulton, the food and beverage and events manager for the Rum Point Club. The bartender substituted Bailey’s Irish Cream, tossed it in the blender and created the Mudslide. Combine all ingredients except garnishes and 1 cup ice in a blender. Blend to a slushy consistency. Pour into a Collins glass or other tall glass. Dip a straw into the Kahlua bottle to fill it with coffee liqueur, then place a finger over the top of the straw to transfer the filled straw to the glass. Place the straw in the drink. Garnish with a cherry and grated cinnamon. Not all Caribbean cocktails are complicated. The Dark & Stormy may be the simplest: a highball made with dark rum, topped up with ginger beer and perhaps a squeeze of lime to finish. But rum maker Gosling’s holds a trademark on the drink, which stipulates that if it’s not made with Gosling’s Black Seal, it’s not a Dark & Stormy. Gosling’s has brought legal action against bars that list the drink made with other rums, but we won’t tell if you make the switch at home.